We are actively engaged in providing a broad array of Textile Foils that are widely used for various purposes. Banking on the skills of our qualified team of professionals, we are involved in providing Textile Foil. Riding on unfathomable volumes of industrial expertise, we are providing a broad array of Textile Foil. Textile Foil For Gujrat, Pack Size: 60"
With the assistance of skilled and experienced professionals, we are engaged in trading and wholesaling a superior range of Textile Foil. This foil is manufactured by our team of vendors by following strict manufacturing process. Our clients can avail from us Textile Foils, which are used to make textiles more attractive and alluring. The foils we offer are made using premium quality raw material that ensures ease in maintenance, ease in application and durability. These foils are available in various finishes, color combinations and designs. Due to prosperous industry expertise and practice, we are providing Hot Stamping Textile Foils to our prestigious patrons. Besides, we offer this product at reasonable prices. 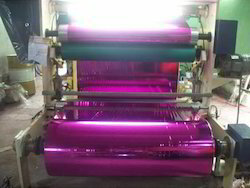 We have various type of colors and holographic range for the textile purpose, also we supply the transfer foil for the textile printing, most of garments exporter and manufacturers recommend our special textile grade hot stamping foil only. In ready made garments industries, Our company is well known for the supply of the special effect hot stamping foil and transfer film, sequinse film etc. We are manufacturing and exporting hot stamping foil which is widely used for various textile applications. Our foils have excellent abrasion and scratch resistance which makes these ideal for packaging different products. We can provide our clients with customized hot stamping foils as per their varied requirements. 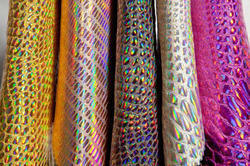 Leather Foils are mainly applied in superficial stamping of all kinds of genuine leather / artificial leather (PU leather, etc) Textile foils are mainly applied in the superficial stamping of both natural textiles and synthetic fiber such as cotton, silk, linen, synthetic fiber, blended fabric, etc. Hot stamping foil for textile, graphic, plastic, & holo graphic. We are manufacturing the Textile Foil, which is widely used for various textile applications. Our Textile foil have excellent abrasion and scratch resistance which makes these ideal for packaging different products. We can provide our clients with customized Textile Foil as per their varied requirements. - CROWN ROLL LEAF INC. – The most reliable foils for textiles, available in various colors including the rare shades. HBC – High quality foils for textiles with most versatile range of colors. Best Quality Foil For Printing On Texlite/ Garments. Available in 12 To 24 Microns.